After joining the protest on Global Divestment Day at City Hall, activists of Phulbari solidarity group joined the UK’s national climate march, expressing full solidarity to the agenda of the Campaign against Climate Change (CCC). On Saturday the 7th March, in the sea of vibrant, peaceful, powerful, and colourful protesters against climate change, the founder of Phulbari Solidarity Group (PSG) and a steering member of Bangladesh National Committee, Rumana Hashem, declared unconditional solidarity to the climate marchers and green planet seekers in London. The PSG and Bangladeshi activists in London marched with the protesters who said that ‘It’s Time To Act‘. The vibrant-marching crowd who gathered outside British Parliament to hear from speakers, chanted slogan, in response to Rumana’s inspiring speech, “we will save our planet”. The march, called “Time to Act”, was designed to increase support for action ahead of the United Nations Framework Convention on Climate Change in Paris. The peaceful yet powerful climate activists who marched from Lincoln’s Inn Fields to Westminster have demanded strong action of the UK government and world leaders at the Paris climate conference in December. The slogans and organisations taking part in the national climate march were diverse. Protesters came from different cities and villages of the UK, and many had traveled with their kids and young children, demonstrating the severity of the cause. Despite the differences in the protesters’ backgrounds in terms of age, class, race, ethnicity, religion and nationality, many of them appeared clearly positive that preventing greenhouse emissions is possible. There was also a consensus that one way of bringing in change is to end capitalism without delay – because it stands in the way to prevent our earth from destroying. Some sixteen inspiring speakers, from across world, have addressed the fascinating crowd. Many of them were women and one was just twelve year old girl. 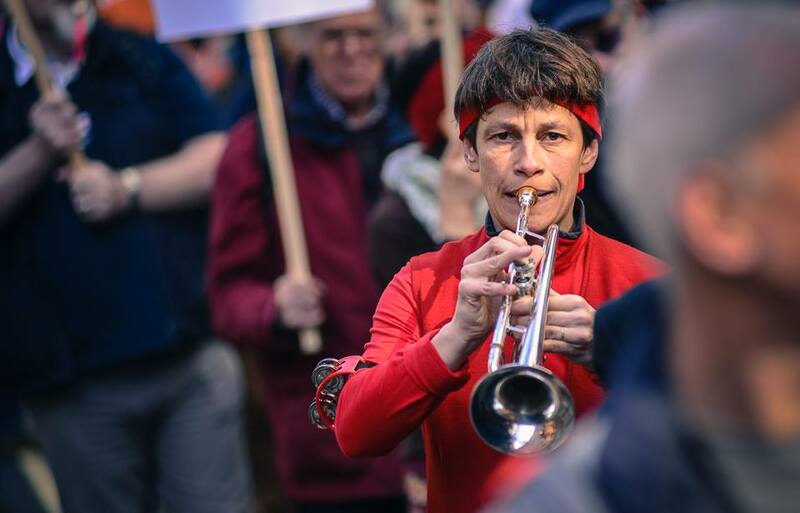 Powerful speakers include MP Caroline Lucas of Green Party, stand-by comedian Francesca Martinez, left wing Labour MP John McDonnell, the head of Greenpeace UK John Sauven, TUC general secretary Frances O’Grady, Bangladeshi environmentalist-feminist Rumana Hashem, and author Naomi Klein. Most amazing speaker of the day was that of a 12 year old Laurel who spoke at the end of the rally and warned everybody that the earth is to be destroyed unless we act now. Also speakers from Caat, Avaaz, People’s Assembly, Axe Drax, Frack Free Lancashire, Stand Up to Racism, UK youth against climate change and the French climate coalition spoke powerfully at the march. The protest was called by the Campaign against Climate Change (CCC) in conjunction with many other organisations. The powerful march ended by a beautiful choir let’s “unite voices, voice-unite, its time to act” . We were only four from Bangladesh National Committee and Phulbari Solidarity Group who attended the rally though it meant a lot to us. The power of people was felt throughout the sunny afternoon, and through our hearts. It was a real life-experience in London. 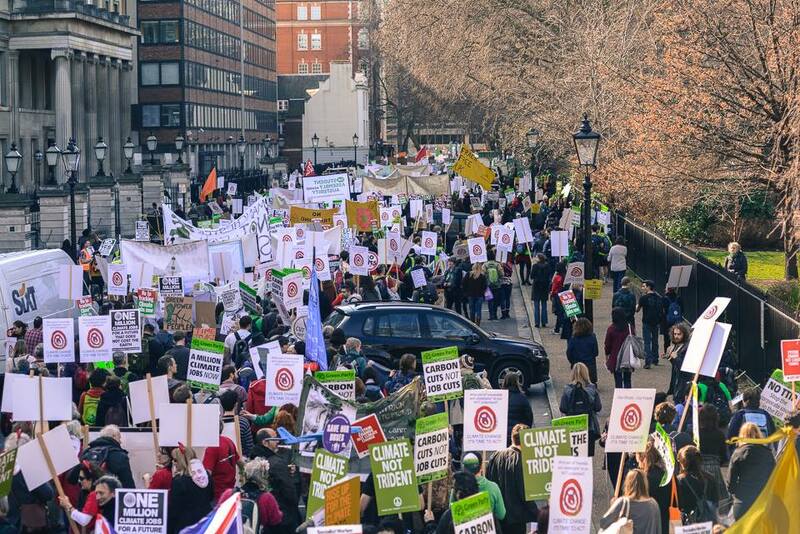 The National Climate March in London reassured many that change is not only required, change is possible. Detailed report and updates with footage and photos are available in the below links. 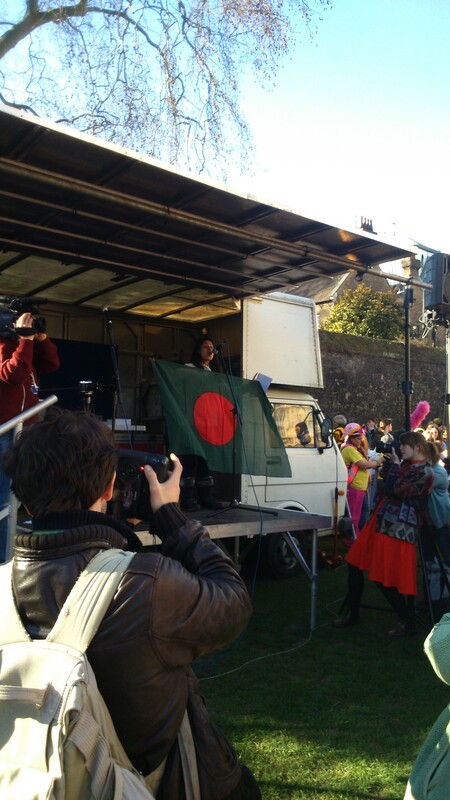 More photos and footage of the participation from Bangladesh and Phulbari Solidarity Group will be uploaded shortly. An AIM-listed London-based multinational company, GCM Resources Plc, is desperately moving to implement an immense open pit coal mine in northwest Bangladesh, forcibly displacing an estimated 130, 000 people and destroying the homes, lands, and water sources of as many as 220,000 people. If the project is implemented, it will destroy over 14,660 acres of fertile agricultural land that produce three food crops annually, threatening to increase hunger in a country in which nearly half of all people currently live below the nutrition poverty line. Locals have protested the project for seven years by forming powerful human chains and rallies. On 26 August 2006, three people were killed and over 200 injured when paramilitary troops fired on a massive protest of some 80,000 demonstrators in Phulbari. 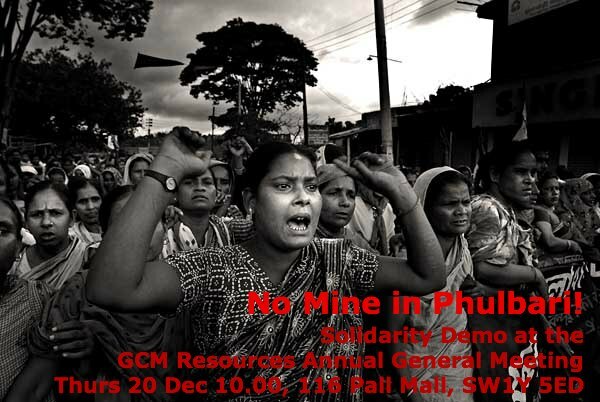 But people in Phulbari are determined to resist this project and to stop GCM Resources plc. The potential for violence has remained high in this project ever since August 2006. Last year the situation sparked by the CEO’s planned visit to Phulbari. People in Phulbari have given verdict against this project. We have served two eviction notices to the company. On 28 February, 2012, seven Special Rapporteurs of the United Nations issued a joint UN press release, calling for an immediate halt to the project on the grounds that it threatens the fundamental human rights of hundreds of thousands of people, including entire villages of indigenous people, and poses “an immediate threat to safety and standards of living.” Still GCM is aggressively moving on to implement this open pit coal mine ignoring the human rights and environmental degradation the project would leave. We want to teach GCM to keep its hands off Bangladesh. We will surround the corrupted miners this December at their AGM. Will you join us in surrounding the dirty coal miners? Will you tell GCM to leave this project? The UK branch of the National Committee to Protect Oil-Gas Mineral Resources and Port-Power in Bangladesh.